Retro-Rides.ca was officially founded in 2013 by owner Jason Komendat. Jason has a passion for people and bicycles and a goal to bring them together in harmony. Customer service is of highest priority, we will genuinely do our very best every day with every client. We guarantee our work, we also back our bicycles with a one year guarantee. Talk to us in the shop for details. We are located at 65 Sparks St. at Elgin. Come visit us Monday to Friday from 9am to 6pm, and Saturdays 10am to 4pm. 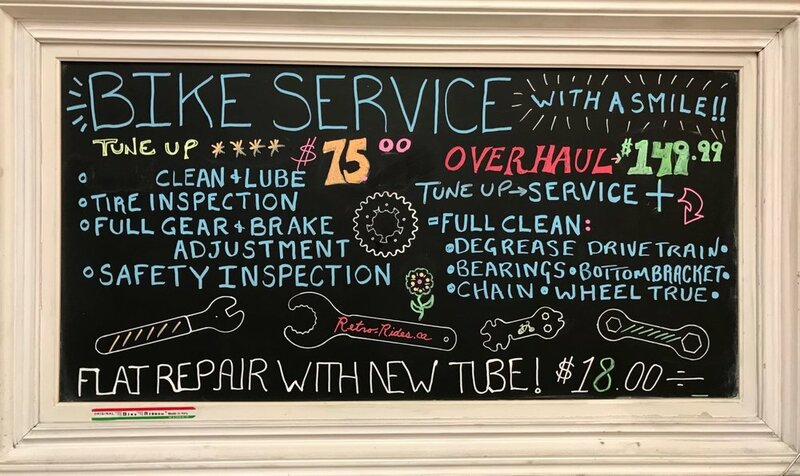 We feature a full service department. 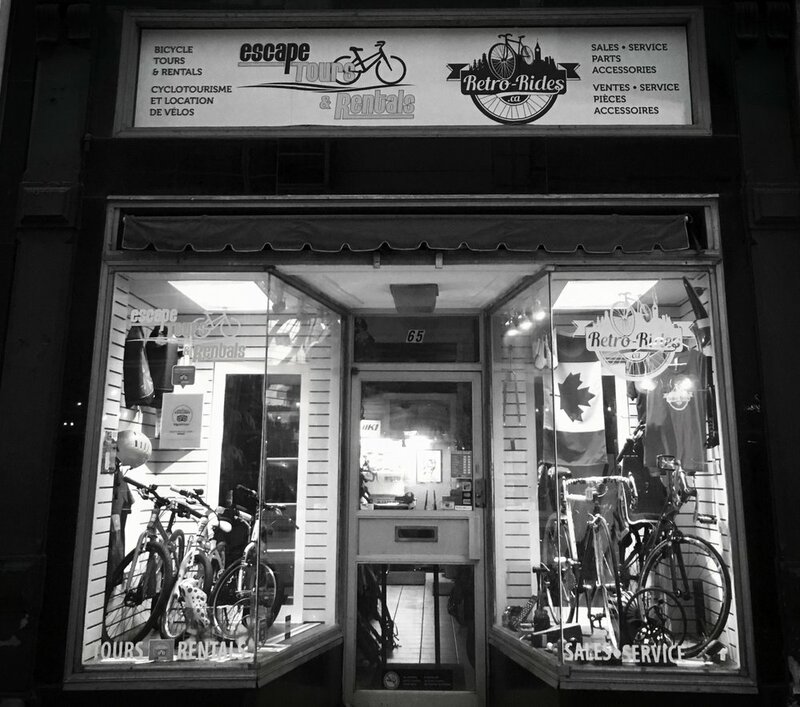 Bring us your bicycle, from vintage to modern for same day repair, no appointment necessary. 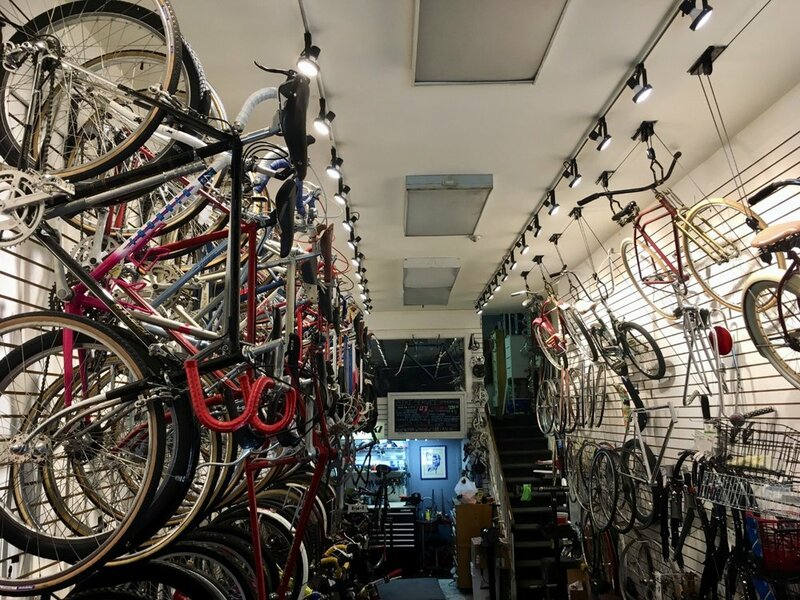 We also carry hard to find parts for vintage bicycles and of course everything needed for modern rides. We have a great selection of quality used and vintage bicycles for sale! Each bike is fully tuned and renewed with fresh parts, elbow grease and a little love! We build custom one off bikes including paint and powder coat. Contact us with your wildest ideas we will make them a reality. Please also visit retroridesca on Insatgram or Facebook for the latest happenings!! Each of our for sale bicycles is hand selected by the owner Jason Komendat, it is then thoroughly safety checked and renewed with care. Each bike receives new tires, tubes, and brake pads. Other parts are replaced as needed, we are preservationists as much as possible after all! This warranty/guarantee is offered with the understanding and expectation that you will take the best care possible of your new bicycle. Please do not let it sleep outside in the rain and snow! We are always happy to see our clients come in for warranty service, it is truly our pleasure to make sure your experience is the best possible. We will not ask you for your receipt, we know our bicycles, we love our bicycles and we deeply respect our clients. It is our goal for you to have a beautiful, safe, and rewarding partnership with your new ride! Purchase with confidence knowing that you have our full support!! Deep clean, degrease and lube of bike including chain, all bearing systems and bottom bracket. Tire inspection and pressure check. Classic, Vintage, Rare & Cool Bikes. Our goal is to get vintage bikes, that would otherwise be destroyed or left rusty and dusty in some old barn, garage or basement, back on the roads. If you have a antique or rare bike with a provenance, we are interested in purchasing that bicyle. We specialize in restoring old bikes, slowly, carefully and while maintaining the original patina, decals and paint. If you have very special bike, one of that no one else has/had. We are interested in acquiring that bike be it a; road bike, mountain bike, track bike, tria bike, folding bike, tandem bike, motorized bike, e-bike or scooter; we are interested. Hey, thanks for filling out this contact form. We will take very good care of your information and we will not spam or solicit you, and we will not give your information to anyone else.